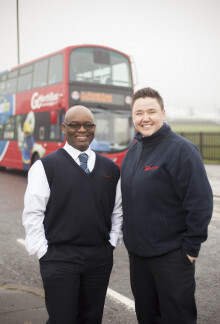 Following a series of contract wins, the region’s largest bus operator, Go North East is looking for new drivers and engineers to fill 90 posts within its award-winning company. The region’s biggest bus company, Go North East, has been shortlisted for three prestigious awards, acknowledging its commitment to excellence within the areas of transport, tourism, training and recruitment. Pop along and test drive a bus on our driving challenge. On Thursday 24 November, BFRS are hosting a Job & Careers Fair at the Catterick Leisure Centre, Catterick Garrison. In an effort to recruit more professional coach drivers, Go North East has changed its ‘essential experience criteria’ to attract more people to apply for 15 new jobs. ​If you have ever thought of a career as a bus driver, but are not quite sure what the job entails, then come along to our Recruitment Day at the Stadium of Light on Sunday 4 September to find out if you could be the ticket! Newcastle residents had a great time at our fun-packed, free, Family Fun Day at Westgate Community College at the weekend. Is your current job driving you up the wall? Are you looking for a new direction? Well perhaps Go North East can help. The region’s largest bus company is holding a recruitment event in Sunderland this Sunday to help find new bus drivers. ​We are supporting Metro Radio and their campaign to generate at least £1million of work in the North East. ​The north east’s largest bus operator has won a £8.5million contract to provide new services to National Express – creating 15 new jobs. Test drive a bus, discuss what the job entails and apply on the day. Come along and see if you've got the ticket! Many staff benefits including fully funded training, free travel, discounts and more.